Ambrose Worthing is no gentleman. He's a proud cold-hearted rake who's determined to stay a bachelor forever. He enjoys bedding a different woman every night without the risk of falling in love. When he hears about a wager over the seduction and ruination of the daughter of his father's best friend, he knows he must intervene. Committing himself to the bet, he agrees to seduce Lady Alexandra Rockford—for her own good. He never expected the lady in question to be a beautiful, fiery creature who has passions of her own that call to his guarded heart. Alexandra Rockford has sworn off men, her heart still broken from the false promises of a childhood sweetheart who left her to marry an heiress. When she stumbles into Ambrose outside of a country ball, she knows the rake is trouble. His smile, his touch, his forbidden kiss are all too tempting but being with him would ruin her. Determined to enjoy herself without falling in love, Alex can't help but let her defenses down with the too charming rake. But when she discovers Ambrose is seducing her to win a bet, it will take everything Ambrose has to prove to her that he is worthy to love her. 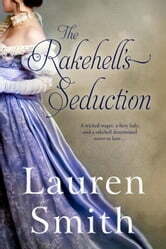 'The Rakehell's Seduction' by Lauren Smith is book Two in the "Seduction" series. This is the story of Ambrose Worthing and Lady Alexandra Rockford. Ambrose is a know rake and seems to be somewhat selfish but when he learns about a bet that is on the books about Alexandra the daughter of his father's best friend. Ambrose goes forward with a plan to try and win the bet in order to help Alexandra in a way. Alexandra has been hurt in the past by a childhood sweetheart who up and married a heiress. So Alexandra has sworn off marriage and knows how to put someone in their place who tries to make demands of her. But Ambrose has a way about him that she is finding hard to fight. Ambrose to is surprised at how much he is attracted to Alexandra. But how will things go when Alexandra finds out what Ambrose is up to. Can Ambrose become the man that Alexandra needs? Wow! This was another great book by Ms. Smith. Ms. Smith is one of my favorite authors and when I see her name on a book I know I will be getting a great story! "My honest review is for a special copy I voluntarily read." A wild young man wants to seduce A young country girl because there is a wager at the club. A lot of money. Are they attracted to each other? Who else wants or needs the money? Will she be ruined?. Will they find each other again? Or be lost for ever? It was so easy to dislike Ambrose, except when it wasn't. Contradicting statement? Yes, but that is the way that I felt. He hid his heart well, but when it came out to play, it set the whole novel on fire. Arrogant, decadent, seductive and brooding this man thrived on being a walking contradiction. When a secret bet puts Alexandra in his sights, his heavily guarded heart may not survive the blow. Alexandra at first glance seems naive in her views, but underneath all of the surface optimism lies a woman with an inner strength and hidden fire just waiting to find it's target. Ms. Smith loves to dole out surprises and with The Rakehell's Seduction she not only gave an enchanting story, she delivered characters that were as mesmerizing and complicated as the writer herself. Well done.